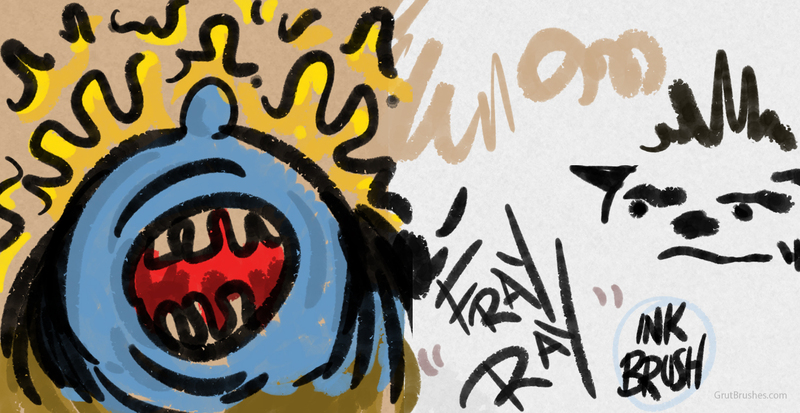 Here are a few scribbles with the Fray Ray brush, a new ink brush I’m working on. It has a nice fine point taper but when you press hard it has jagged frayed edges. One of this brush’s features is that it has a varying translucency to it, as if the ink is not 100% opaque, or the brush may be loaded with a bit too much water. Drag the stylus a bit slower and you will get that dark full opacity but sketch quickly and you see those nice patches of translucency that suggest some excitement in your sketches, evidence of a frenzied wrist.